By "the fall" I am not referring to Adam and Eve! 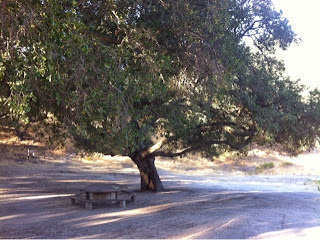 Below is THE tree that Daniel was playing in when he descended and landed "wrong" on his right hand. Now, anyway you slice it, he is sitting out of the teenage-boy-game for at least six weeks. What went wrong? He was playing Frisbee with friends (yes, while up in a tree) and when time to climb down he miscalculated, swinging down and KER-PLUNK! The painful result was showcased in my previous post; a VERY broken wrist in two places. So, Teckie skipped work and we drove 2.5 hours to the campground at Lake Lopez near Arroyo Grande. I knew camp breakfast would start at 8AM and figured we could eat some grub before we headed south to an orthopedic doctor. "Can we get out of here?" This was not easy, especially for Daniel, who was running on a Vicodin fueled night, little sleep and exhaustion. My heart was sad, and knew it was time for us to pack him up and split. We asked our friend and teen leader, Matt, to help pack his belongings. All the kids were eager to help us and wanted badly to talk/connect with Daniel. They had all seen the crazy x-rays from the ER trip the night before. Just leave. Go home. Pronto. We acted swift as possible, but still had to thank the two dads, John and Stan, that had helped through the hospital experience and especially the one, whom he spent the night with in his large motor home. 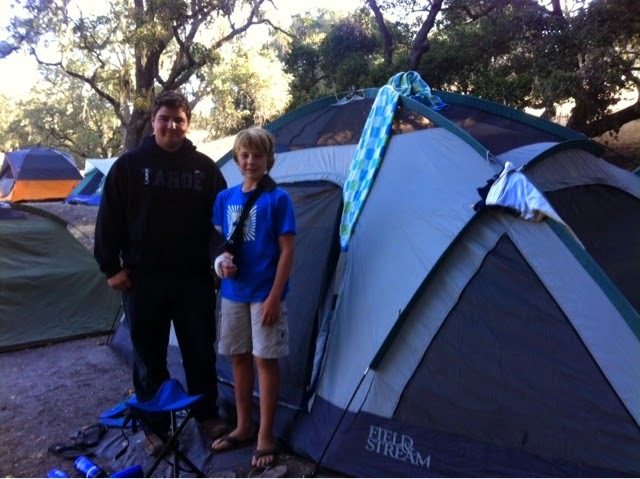 Leaving the campground, we made an appointment with the pediatric orthopedist in Santa Barbara who has cared for brother, Lucas, and his many broken collar bones. Actually, the good doctors were booked solid, but would work us in first thing when they arrived at noon. We drove to Miss Piggy's house and collapsed until the appointment. She gave Daniel an extra dose of TLC; even letting him eat on her beloved couch that she just had cleaned. Hawaiian cousin, Lilia, was still visiting, and it gave Daniel a chance to say hello. Then he fell fast asleep ... AGAIN. That was pretty much his day. 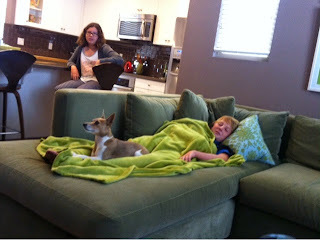 Much to our liking the doctor said that Daniel did NOT need surgery and complimented the emergency room physician, Dr. Slaughter, for resetting the bones so well. Puffy-baseball-mitt-of-a-hand could not be casted. 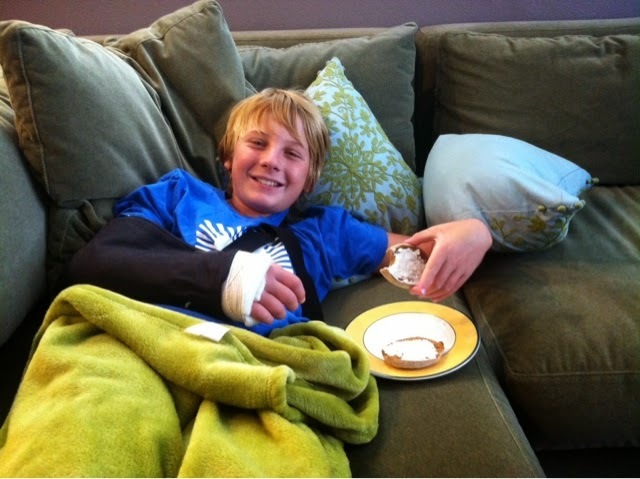 cast that he will sport for three weeks. In the meantime, he will miss an air soft battle, a visit to the MB2 Raceway AND a trip to Hurricane Harbor! However, there is NADA disappointment over this loss (at least from us parent-folk). We are 100% thankful that he did not land on his melon climbing out of that tree. Plus, in perspective, this was not "open heart surgery"
--- our measuring stick for unexpected childhood "Owies." For now, Daniel will chill out and NOT go to the beach, NOT skateboard and NOT play video games. There's MUCHO concentrated down time to praise thanks on our heavenly Father who keeps his eyes upon us and arms around us ... even through the bad stuff.